This topic provides an overview of the Electronic reporting (ER) tool. It includes information about key concepts, the scenarios that ER supports, and a list of formats that have been designed and released as part of the solution. ER is a tool that you can use to configure formats for both incoming and outgoing electronic documents in accordance with the legal requirements of various countries/regions. ER lets you manage these formats during their lifecycle. For example, you can adopt new regulatory requirements, and generate business documents in the required format to electronically exchange information with government bodies, banks, and other parties. The ER engine is targeted at business users instead of developers. Because you configure formats instead of code, the processes for creating and adjusting formats for electronic documents are faster and easier. ER currently supports the TEXT, XML, Microsoft Word document, and OPENXML worksheet formats. However, an extension interface provides support for additional formats. It represents a single shared tool for electronic reporting in different domains and replaces more than 20 different engines that do some type of electronic reporting for Microsoft Dynamics 365 for Finance and Operations. It makes a report's format insulated from the current Finance and Operations implementation. In other words, the format is applicable for different versions of Finance and Operations. It supports the creation of a custom format that is based on an original format. It also includes capabilities for automatically upgrading the customized format when the original format is changed because of localization/customization requirements. 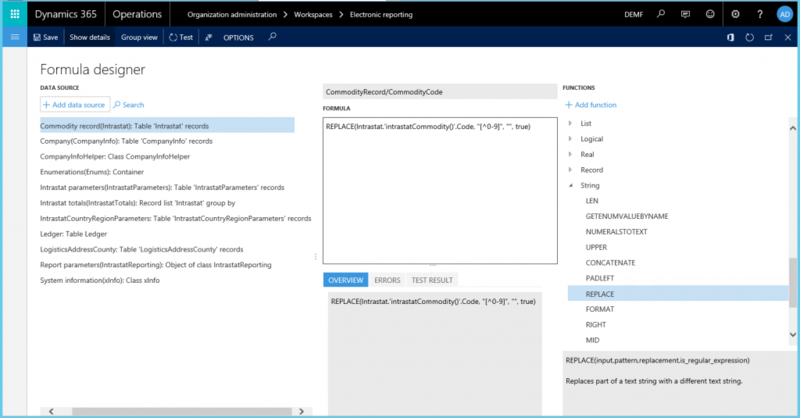 It becomes the primary standard tool to support localization requirements in electronic reporting, both for Microsoft and for Microsoft partners. It supports the ability to distribute formats to partners and customers through Microsoft Dynamics Lifecycle Services (LCS). ER supports two types of components: Data model and Format. A data model, as a set of domain-specific business entities and a hierarchically structured definition of relations between those entities. A model mapping that links selected Finance and Operations data sources to individual elements of a data model that specifies, at run time, the data flow and rules of business data population to a data model component. A business entity of a data model is represented as a container (record). Business entity properties are represented as data items (fields). Each data item has a unique name, label, description, and value. The value of each data item can be designed so that it's recognized as a string, integer, real, date, enumeration, Boolean, and so on. Additionally, it can be another record or records list. Note that business entities such as company and payment transactions are designed one time. Different mappings then reuse them. It can use different Finance and Operations data types as data sources for a data model. For example, it can use tables, data entities, methods, or enums. It supports user input parameters that can be defined as data sources for a data model when some data must be specified at run time. It supports the transformation of Finance and Operations data into required groups. It also lets you filter, sort, and sum data, and append logical calculated fields that are designed through formulas that resemble Microsoft Excel formulas, as shown in the following illustration. For more information, see Formula designer in Electronic reporting). It can use different updatable data elements as targets. These data elements include tables, data entities, and views. The data can be updated by using the data from incoming electronic documents. Multiple targets can be used in a single model mapping. A data model component is designed for each business domain that should be used as a unified data source for reporting that isolates reporting from the physical implementation of data sources. It represents domain-specific business concepts and functionalities in a form that makes a reporting format's initial design and further maintenance more efficient. A format that defines the structure and content of the outgoing electronic document that is generated at run time. Data sources, as a set of user input parameters and a domain-specific data model that uses a selected model mapping. A format mapping, as a set of bindings of format data sources that have individual elements of a format that specify, at run time, the data flow and rules for format output generation. A format validation, as a set of configurable rules that control report generation at run time, depending on the running context. For example, there might be a rule that stops output generation of a vendor's payments and throws an exception when specific attributes of the selected vendor are missing, such as the bank account number. Creation of reporting output as individual files in various formats, such as text, XML, Microsoft Word document, or worksheet. Creation of multiple files separately and encapsulation of those files into zip files. The following illustration shows how the data flows for these formats. To run a single ER format configuration and generate an outgoing electronic document, you must identify the mapping of the format configuration. A format that defines the structure and content of the incoming electronic document that contains data that is imported at run time. A format component is used to parse an incoming document in various formats, such as text and XML. A format mapping that binds individual format elements to elements of a domain-specific data model. At run time, the elements in the data model specify the data flow and the rules for importing data from an incoming document, and then store the data in a data model. A format validation, as a set of configurable rules that control data import at run time, depending on the running context. For example, there might be a rule that stops data import of a bank statement that has a vendor's payments and throws an exception when a specific vendor's attributes are missing, such as the vendor identification code. To run a single ER format configuration to import data from an incoming electronic document, you must identify the desired mapping of a format configuration, and also the integration point of a model mapping. You can use the same model mapping and destinations together with different formats for different type of incoming documents. The version that is originally created is marked as a Draft version. This version can be edited and is available for test runs. The Draft version can be converted to a Completed version. This version can be used in local reporting processes. The Completed version can be converted to a Shared version. This version is published on LCS and can be used in global reporting processes. The Shared version can be converted to a Discontinued version. This version can then be deleted. The component can be serialized in XML format and exported as a file in XML format. The component can be reserialized from an XML file and imported into Finance and Operations as a new version of an ER component. ER component versions are date-effective. You can set the Effective from date for an ER component to specify the date that the component becomes effective for reporting processes. The Finance and Operations session date is used to define whether a component is valid for execution. If more than one version is valid for a particular date, the latest version is used for reporting processes. Access to ER format components depends on the setting for the ISO country/region code. When this setting is blank for a selected version of a format configuration, a format component can be accessed from any company at run time. When this setting contains ISO country/region codes, a format component is available only from companies that have a primary address that is defined for one of a format component's ISO country/region codes. Different versions of a data format component can have different settings for ISO country/region codes. An ER configuration is the wrapper of a particular ER component. That component can be either a data model component or a format component. A configuration can include different versions of an ER component. Each configuration is marked as owned by a specific configuration provider. The Draft version of a component of a configuration can be edited when the owner of the configuration has been selected as an active provider in the ER settings in Finance and Operations. Each model configuration contains a data model component. 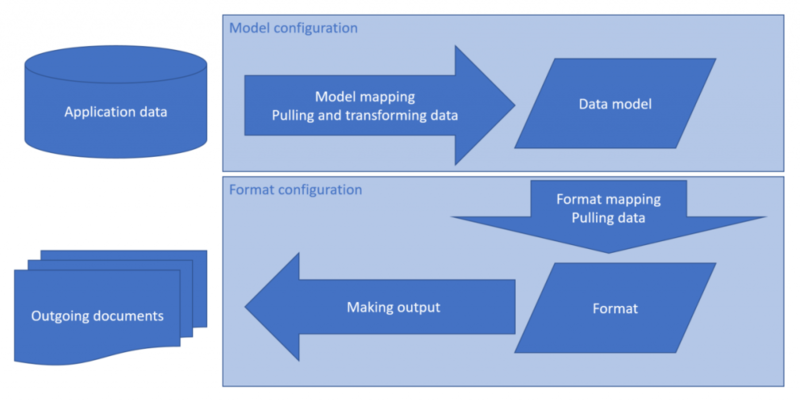 A new format configuration can be derived from a specific data model configuration. In the configuration tree, the format configuration that is created appears as a child of the original data model configuration. The format configuration that is created contains a format component. The data model component of the original model configuration is automatically inserted into the format component of the child format configuration as a default data source. An ER configuration is shared for Finance and Operations companies. The ER provider is the party identifier that is used to indicate the author (owner) of each ER configuration. ER lets you manage the list of configuration providers. Format configurations that are released for electronic documents as part of the Finance and Operations solution are marked as owned by the Microsoft configuration provider. To learn how to register a new ER provider, play the task guide, ER Create a configuration provider and mark it as active (part of the 7.5.4.3 Acquire/Develop IT service/solution components (10677) business process). An LCS shared library repository provides access to the list of configurations within the Shared asset library in Lifecycle Services (LCS). This type of ER repository can only be registered for the Microsoft provider. From the LCS Shared asset library you can import the latest versions of ER configurations into the current Finance and Operations instance. An LCS project repository provides access to the list of configurations of a specific LCS project (LCS project assets library) that was selected at the repository registration stage. ER lets you upload shared configurations from the current Finance and Operations instance to a specific LCS project repository. 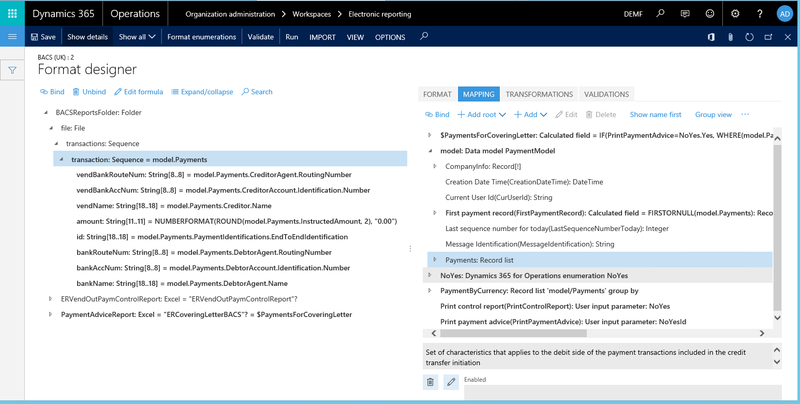 You can also import configurations from an LCS project repository into the current Finance and Operations instance. A File system repository provides access to the list of configurations that are located as xml files in the specific folder of the local file system of the machine where the AOS service is hosted. Required folder is selected at the repository registration stage. You can import configurations from a File system repository into the current Finance and Operations instance. For more information, see Import Electronic reporting (ER) configurations. An RCS instance repository provides access to the list of configurations of a specific RCS instance that was selected at the repository registration stage. ER lets you import completed or shared configurations from the selected RCS instance into the current Finance and Operations instance so you can use them for electronic reporting. For more information, see Import Electronic reporting (ER) configurations from Regulatory Configuration Services (RCS). 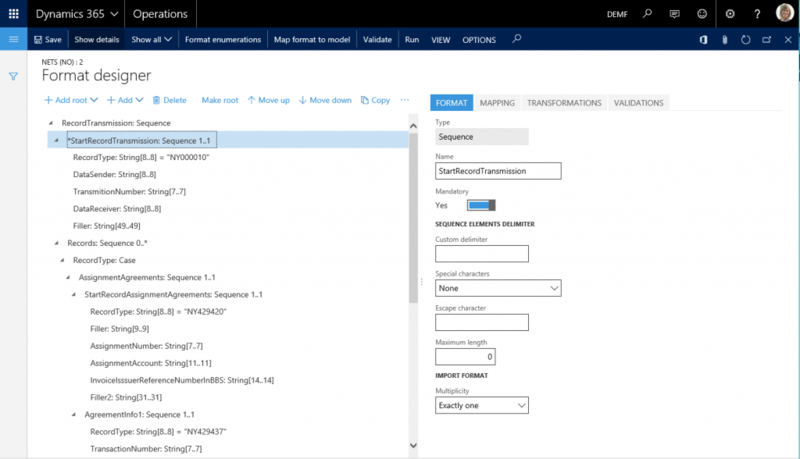 An Operations resources repository provides access to the list of configurations that Microsoft, as an ER configuration provider, initially releases as part of the Finance and Operations solution. These configurations can be imported into the current Finance and Operations instance and used for electronic reporting or playing sample task guides. They can also be used for additional localizations and customizations. Note that the latest versions provided by Microsoft ER configurations must be imported from the LCS Shared asset library by using corresponding the ER repository. Required LCS project, File system, and Regulatory Configuration Services (RCS) repositories can be registered individually for each configuration provider of the current Finance and Operations instance. Each repository can be dedicated to a specific configuration provider. ER provides a model designer that you can use to build a data model for a particular business domain. All domain-specific business entities, and the relations between them, can be presented in a data model as a hierarchical structure. The following illustration shows an example of this type of data model (the payment domain data model). To become familiar with the details of this scenario, play the ER Design domain specific data model task guide (part of the 7.5.4.3 Acquire/Develop IT service/solution components (10677) business process). At design time, to make the content more intelligible for format designers who speak other languages, and who will use the data model for data mapping of format components. At run time, to make the content more user-friendly by presenting prompts and help for run-time parameters, and configured validation messages (errors and warnings), in the language that the currently signed-in user prefers. The following illustration shows an example where data model content is translated from English to Japanese. ER provides a model mapping designer that lets users map data models that they have designed to specific Finance and Operations data sources. Based on the mapping, the data will be imported at run time from selected data sources into the data model. The data model is then used as an abstract data source of ER formats that generate outgoing electronic documents. The following illustration shows an example of this type of data model mapping (the SEPA Credit Transfer model mapping of the payment domain data model). To become familiar with the details of this scenario, play the ER Define model mapping and select data sources and ER Map data model to selected data sources task guides (part of the 7.5.4.3 Acquire/Develop IT service/solution components (10677) business process). ER provides a model mapping designer that lets users map data models that they have designed to specific destinations. For example, data models can be mapped to the Finance and Operations updatable data components (tables, data entities, and views). Based on the mapping, the Finance and Operations data will be updated at run time by using the data from the data model. As abstract storage of the ER format, the data model is filled with data that is imported from an incoming electronic document. The following illustration shows an example of this type of data model mapping. In this example, the Import mapping for NETS model mapping of the payment domain data model is used to support the import of bank statements in the NETS bank format for Norway. ER can store a designed data model, together with associated data mappings, as a model configuration of the current Finance and Operations instance. The following illustration shows an example of this type of data model configuration (the payment model configuration). To become familiar with the details of this scenario, play the ER Map data model to selected data sources task guide (part of the 7.5.4.3 Acquire/Develop IT service/solution components (10677) business process). ER supports a format designer that you can use to build the format of an electronic document for a selected business domain by selecting the model component as a base. The same ER format designer lets you map a format that you create to a selected domain's data model mapping as a data source. The following illustration shows an example of this type of format (the format configuration that supports the BACS payment format for the United Kingdom). To become familiar with the details of this scenario, play the ER Design domain specific format task guide (part of the 7.5.4.3 Acquire/Develop IT service/solution components (10677) business process). The ER format designer can be used to build an electronic document in OPENXML worksheet format. The following illustration shows an example of this type of format (a format configuration to generate OPENXML worksheet with details of a selected payment journal). To become familiar with the details of this scenario, play the ER Create a configuration for reports in OPENXML format task guide (part of the 7.5.4.3 Acquire/Develop IT service/solution components (10677) business process). As part of the task guide step for importing a template, use the Template of Payment Report (SampleVendPaymWsReport.xlsx) Excel file as a template. The ER format designer can be used to build an electronic document in a Word document format. The following illustration shows an example of this type of format. Note that this format reuses the existing ER configuration that was originally designed to generate the report output in OPENXML format. The ER format designer can be used to describe an electronic document that is planned for data import in either XML or text format. The designed format is used to parse an incoming document. The ER format mapping designer can be used to define the binding of the elements of the designed format to the data model. The following illustrations show an example of this type of format and format mapping. In this example, NETS bank statements that include vendor payment details in text format are imported. ER can store a designed format together with the configured data mappings as a format configuration of the current Finance and Operations instance. The preceding illustration shows an example of this type of format configuration (BACS (UK), which is a child of the Payment model configuration). To become familiar with the details of this scenario, play the ER Design domain specific format task guide (part of the 7.5.4.3 Acquire/Develop IT service/solution components (10677) business process). 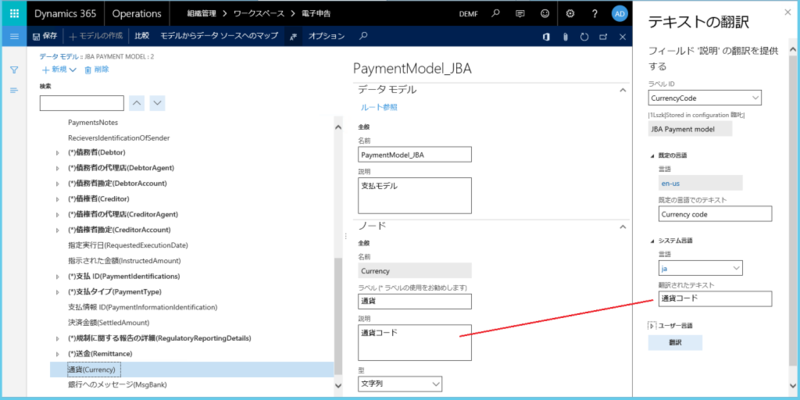 To become familiar with the details of this scenario, play the ER Use format to generate electronic document for payments task guide (part of the 7.5.4.3 Acquire/Develop IT service/solution components (10677) business process). The owner of a component (model or format) that has been created can use ER to publish the completed version of the component to LCS. A repository of the LCS project type for the current ER configuration provider is required. When the status of the completed version of a component is changed from COMPLETED to SHARED, that version is published in LCS. When a component has been published to LCS, the owner of that component becomes a provider of the service to support the component. For example, if the format component is designed to generate an electronic document that is legally required (for example, in accordance with a localization scenario), it's assumed that the format will be kept compliant with legislative changes, and that the provider will issue new versions of the component whenever new legislative requirements arise. To become familiar with the details of this scenario, play the ER Upload a configuration into Lifecycle Services task guide (part of the 7.5.4.3 Acquire/Develop IT service/solution components (10677) business process). ER lets you import ER components from LCS to the current Finance and Operations instance. A repository of the LCS project type is required. When an ER component has been imported from LCS to the current Finance and Operations instance, the owner of the instance becomes a consumer of the service that is provided by the owner (author) of the imported component. For example, if a format component is designed to generate a specific electronic document from Finance and Operations in a country/region-specific format (localization scenario), it's assumed that the service consumer will be able to obtain any updates that are made to that format, to keep it compliant with legislative requirements. 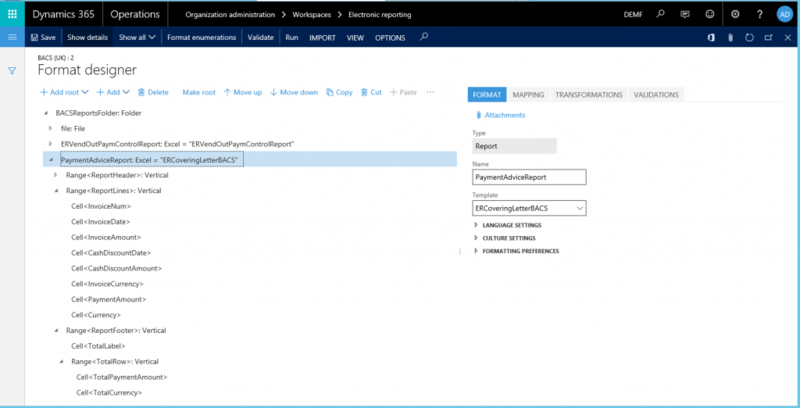 To become familiar with the details of this scenario, play the ER Import a configuration from Lifecycle Services task guide (part of the 7.5.4.3 Acquire/Develop IT service/solution components (10677) business process). ER lets you create (derive) a new component from the current version of a component (base) that was imported from LCS. For example, a user wants to derive a new format to implement some special requirements for an electronic document (such as an additional field or an extensive description) to support a customization scenario. To become familiar with the details of this scenario, play the ER Upgrade format by adoption of new base version of it task guide (part of the 7.5.4.3 Acquire/Develop IT service/solution components (10677) business process). ER lets you automatically adopt changes of the latest version of the base component in the current draft version of the derived component. This process is known as rebasing. For example, a new regulatory change that has been introduced in the latest version of the format that was imported from LCS can be automatically merged into the customized version of this format of the electronic document. Any changes that can't be merged automatically are considered conflicts. These conflicts are presented for manual resolution in the designer tool for the appropriate component. To become familiar with the details of this scenario, play the ER Upgrade format by adoption of new base version of that format task guide (part of the 7.5.5.3 Acquire/Develop changed IT service/solution component (10683) business process).